The bedlum seems to have died down, thank goodness, so there isn't much to report. The Montero is playing up again, I took it to the Mechanic I use, because I was worried about the oil leak from the crankcase, and a noise had developed under the car, so I was thinking maybe the crankshaft was short of lubricant, also the car has been running a bit rough. It turns out that he thinks the noise problem is with the rear differential, and the engine may be down one cylinder, which looking on the bright side could be a problem with one of the leads, unfortunately he had two cars in bits, so I am having to wait until Tuesday for it to go in, I have no idea how long he will need the car, but it probably wont matter. The Mother-in-law is going in for minor surgery on a foot next week, Marcela will have to work full days in the shop, I will be the taxi driver, and would have to use the Logan anyway, also it makes more sense for Marcela to live at her Mum's during the week, whilst working long hours, twelve hours a day, and driving each way from here, doesn't make a lot of sense, so she won't need the car. I do wonder whether I should have changed the Montero, due to it's age, but even if I did, I would have no guarantee that the next one would be any better, so although I don't like having to shell out money on a car, I am happy to stick with my 1996 model! 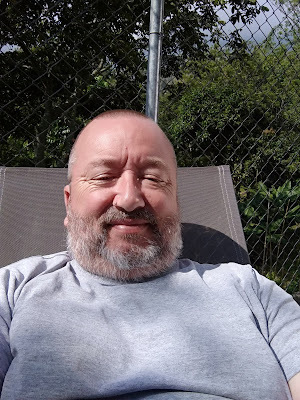 I had planned to drop the Montero off on the way to a check up with my Orthopaedic Surgeon, on my knees, but there is no panic any more, we had a phone call yesterday cancelling my appointment. It turns out that my Health Service Provider, SURA, has removed my Orthopaedic Surgeon from their Complimentary Plan service, apparently this was done in August, but the Orthopods Secretary only notified us four days before the appointment, I am not impressed, as I was going to consult with him over the problem with the trapped nerve in my arm. The Secretary told Marcela, that if I went to my Family Doctor, and asked for an Orthopaedic referral, like all the other Patients on his books, I would be referred back to him, under the normal healthcare, as he has all the case notes. However now, any appointment would be next year... To be honest, I am not sure what to do, he is a good Surgeon, but I don't like the way I have been treated, I may just see another Surgeon under the Complimentary Plan, but there again, I have now been under this Surgeon for three years, I might be doing myself a diservice by changing, I'll think about it. There should be more than enough here to complete the three frames, if not, I can soon run off a few more. 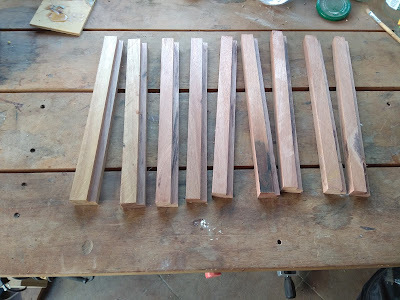 Now, I will plane them all to the same thickness and give them a light sanding, then it's a case of waiting for the photos. before the daily thunder storms rolled in mid afternoon, which they are doing on a daily basis, hopefully this will change shortly, I've had enough of the rain, it's time for some summer, or the second dry season of the year, albeit it will be our first this year, because for some reason the first one never came!